nRBC counts < 5/100 WBC. Automated hemograms: The automated hemogram does not include a manual differential cell count. In most animals, the numbers of nRBCs are too low to significantly affect the WBC count, but in disorders where nRBCs are found in high numbers, e.g. lead poisoning, immune-mediated hemolytic anemia, the impact on the WBC count can be substantial. When there are more than about 20 nRBC/100 WBC, we can sometimes detect the presence of nRBC by examining the WBC scatterplots from our analyzer. However, this technique is not sensitive or necessarily specific for nRBC. Camelids can have up to 3 nRBC/100 WBC in health (our current reference interval). Dogs can have up to 1 nRBC/100 WBC (our current reference interval). There are anecdotal reports that Miniature Schnauzers and Dachshunds can have slightly higher numbers of nRBCs in health (up to 7 nRBC/100 WBC), however this remains to be substantiated with defined studies. Premature neonates or fetuses also have higher nRBC than full term neonates. Regenerative anemia: nRBC may be seen in a regenerative anemia, particularly that due to hemolysis. The mechanism for their presence in uncertain, because they do not indicate regeneration alone and may reflect an altered marrow or splenic microenvironment in certain types of anemia. But we do frequently see them in blood with regenerative anemias. If numbers of nRBCs are proportionate to the degree of polychromasia (a very subjective assessment), we usually do not pursue a separate explanation for their presence in regenerative anemias. If they are disproportionate, e.g. 125 nRBC/100 WBC with only mild polychromasia (e.g. 150,000/ul reticulocytes in blood from a dog), we would look for a cause, e.g. bone marrow injury, altered splenic function, lead poisoning etc. Bone marrow injury: Bone marrow injury can occur from conditions, such as systemic sepsis or endotoxemia (this is most commonly observed in cats and llamas). We have also seen nRBC in the circulation of horses (a very rare finding in this species) with presumptive bone marrow injury secondary to T cell lymphoma. Heat stroke: Nucleated red blood cells can be frequently seen in dogs with heat stroke. This is assumed to be secondary to bone marrow injury but could also be due to altered splenic function (Mastrorilli et al., 2013). Lead poisoning: A marked erythroblastosis with polychromasia in a non-anemic animal is a hallmark of lead poisoning in small animals. Basophilic stippling may also be seen but can be observed in these species with regenerative anemias. Calves with lead poisoning can have excessive nRBC (without polychromasia or macrocytes, i.e. no evidence of a regenerative response). Affected calves are usually not anemic. 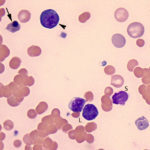 Dyserythropoiesis: Nucleated red blood cells may be seen in the circulation in animals with inherited or acquired dyserythropoiesis. Inherited: Miniature and Toy Poodles with hereditary macrocytosis (a form of inherited dyserythropoiesis) may also have abnormal nRBCs in circulation. These dogs are not usually anemic. Acquired: Acquired dyserythropoiesis can occur secondary to drugs that interfere with folate and vitamin B12 metabolism. Animals may or may not be anemic. Dyserythropoiesis can also occur as a consequence of hematopoietic neoplasia, specifically acute myeloid leukemia or myelodysplastic syndrome. The cells in the latter conditions are frequently morphologically abnormal, and provide a clue to the diagnosis. Animals are usually anemic in these conditions. Altered splenic function: Increased nRBCs may be seen in dogs on corticosteroids, after splenectomy or dogs with splenic hemangiosarcoma. Splenic macrophages are thought to normally remove these cells from the circulation, so if splenic function is impaired, nRBC can be seen in the circulation (along with excessive numbers of Howell-Jolly bodies). Unknown mechanism: Sick camelids (anemic or non-anemic) can frequently have high numbers of nucleated red blood cells in circulation. Even in anemic animals, this does not indicate a regenerative response alone (we need to see polychromatophils as well to confirm a regenerative response). This is presumably due to bone marrow release or a dysfunctional marrow, but altered splenic function is also possible.